The restaurant has been named to pay homage to the most famous English silent actor: Charlie Chaplin. At Charlie's we are very passionate about authentic Italian cuisine. 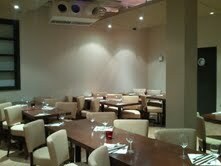 Ciao Bella brings you a true Mediterranean atmosphere great for parties or a meal out with family or friends. Our menu is varied drawing from the best of styles in and around the Mediterranean Sea. What's in season, healthy and nutritious, freshly prepared and tasty. DegÃ² restaurant offers a regularly updated high quality menu, an extensive wine list and a selection of tasteful cocktails.